Its time for Giving Tuesday. I saved up my birthday present money and took out my change jar to use for charitable donation. I suggested that Annie choose a bunch of toys that are in good condition to bring to the Helen Woodward Center. So she did. Then I told that she will feel so good giving toys to orphan dogs that are waiting for their forever homes. She barked "wait a minute! I thought they were just going to borrow them to play with?" I barked back " Annie! Its Giving Tuesday, not Lending Tuesday! " Thanks! 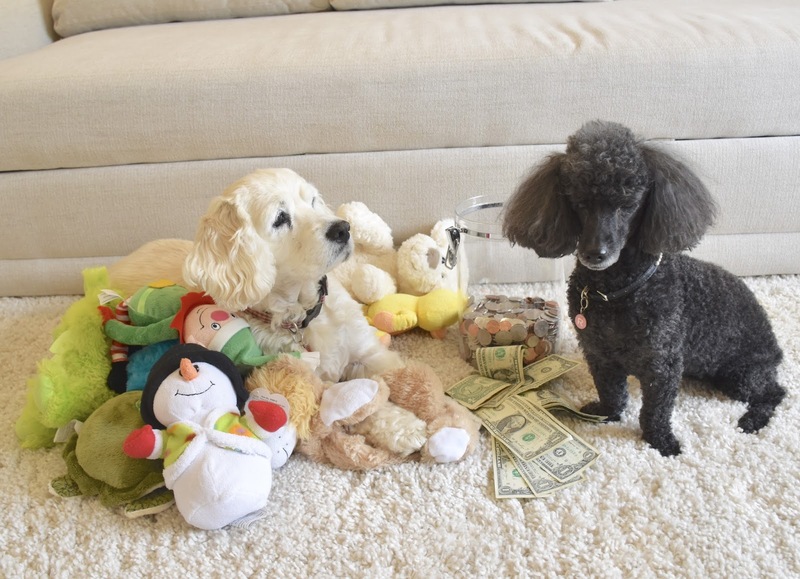 Yes, we like helping pups not as fortunate as us! RosyPoodleKisses! Aw, Sweet Annie! OurGirl knows just how she feels. She has an enormous collection of stuffed animals and every one is special. Did Annie have a toy when she was waiting for her furever home? Maybe that would help her part with some. Your change jar is an excellent idea. We have a maneki-neko cat bank. We'll go empty it right now and send it to Old Dog Haven, one of OurPeople's favorite non-profits. HWAC is a fab place! Mommy's friend just got a puppy there last week! Annie loves all her toys and would prefer Mommy buy the shelter dogs new toys. I told her that may be a very good idea for Annie Day coming up next month! RosyPoodleKisses! It was very thoughtful and generous of you to donate some of your money to the homeless animals. I'm impressed with your piggy bank. Mine has only dimes.